This is a 10 inches tiered chocolate cake. 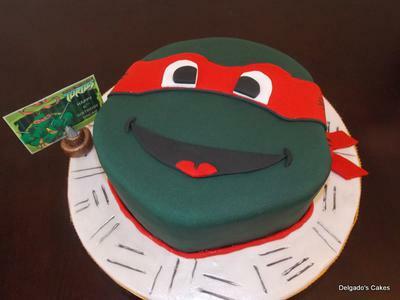 It was carved as the Raphael the Ninja Turtle . I filled it with Hershey's fudge and caramel. I covered with butter cream and then covered with fondant. I cut out the eyes, placed the mask, placed the mouth, dimples and the tongue. 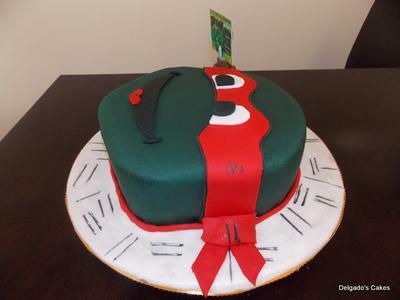 I outlined the mask with very thin string out of fondant. I covered the 14" bottom board with pearl dust and used the edible marker and make random lines for decoration.